On a glorious morning my dog Baxter and I joined co-workers and friends for a kayak excursion on nearby Fern Ridge Reservoir. No wind was present as the sun rose over the Cascades, giving us a warm welcome for the morning. Oregon Paddle Sports supplied kayaks and stand-up paddle boards for the group, which is an option for those of you who don’t own watercraft. 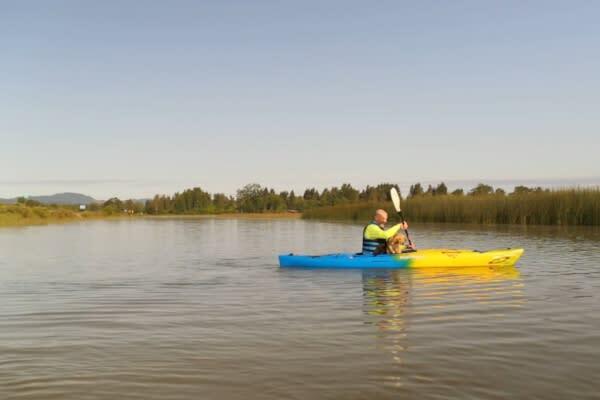 They will be renting equipment at the reservoir this summer, so stop by Perkins Peninsula Park, located off Highway 126 roughly 5 miles from Eugene, and take advantage of their expertise and quality gear. This County park requires payment, so be prepared to use the self-pay station or pick up an annual permit. I bought my annual permit at the Eugene, Cascades & Coast Adventure Center off I-5 and Gateway Street in Springfield. 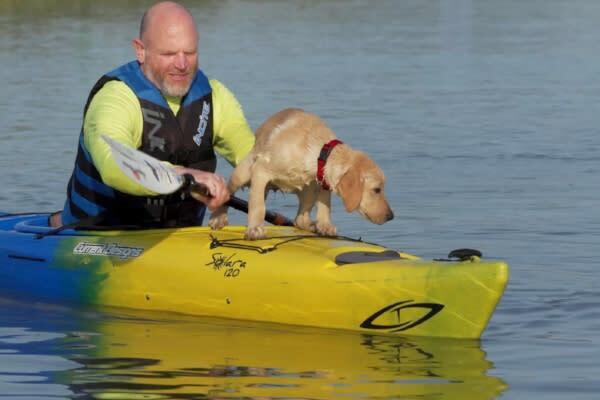 At 14 weeks old, Baxter had only dipped his toes in the Willamette River and so it was to my surprise he didn’t hesitate leaping into the water when he got excited seeing a kayak cruise near the dock. With a shocked looked he surfaced and I pulled him onto the dock where his shock turned to excitement as he flung the water from his fur. 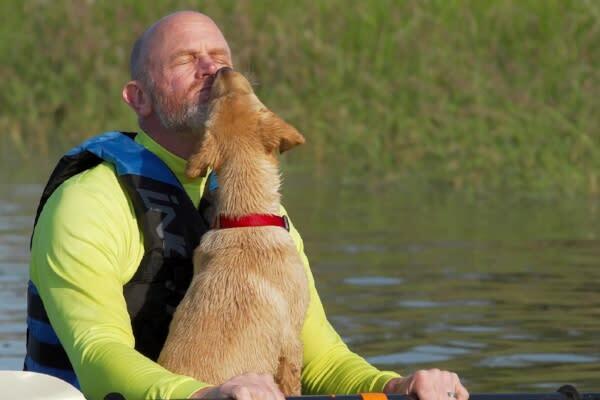 Once into our step inside kayak, Baxter settled on my lap and we headed out along the channel that leads to Coyote Creek. Viewing the other kayaks, boats, waterfowl and fish rising kept him actively scanning the environment as we tried to keep up. Having a squiggly, nearly 30-pound, ball of fur on your lap doesn’t do much for paddling technique or rhythm, but we managed to keep up. 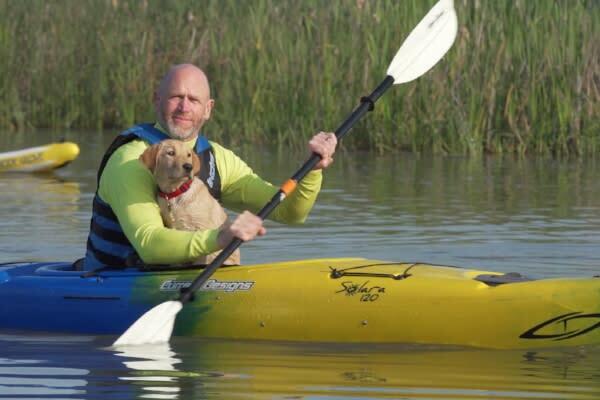 Baxter got his sea legs and gained enough courage to walk to the front tip of the kayak. Showing good balance he turned to face me as I attempted to begin paddling. With nothing for his nails to grip he plunged into the channel and disappeared. A quick u-turn in the kayak and I was positioned to see him confidently swimming toward me. After shedding his excess water on me, we were back in formation and headed along Coyote Creek heading north. Fern Ridge has an abundance of waterfowl and several nesting stations provide viewing. One such structure features multiple birdhouses, which on this morning was filled with chicks being fed by their mothers. This paddle is very peaceful as the din of traffic on Highway 126 fades as you move a short distance along the creek. Arriving back at the dock we found the restrooms accessible for quick change of clothes before heading into Veneta for a bite to eat at must-do stop, Our Daily Bread. Built in an old church building, Our Daily bread offers a full menu for breakfast, lunch and dinner. They serve from a good selection of area wineries and often have live music to enjoy. On this amazing June day we ate breakfast on the patio as water dripped from the nearby fountain. A great way to cap another first for Baxter. What’s next for Baxter? Be sure to check back and see!